This is a companion article to the Eastern Loop description article here. The introduction is similar but the rest of the article describes a loop of about 4 miles (shown in map below with red arrows). Let us know in the comments how you like these trails. First, get to the park. It is about a mile east of the Cross River/Route 35/ Route 121 stoplight on the right side. If you are coming from the east (Ridgefield CT), you will pass a Mobil station on your right and the park is the next left after that. Look for a small white sign marked “Lewisboro Town Park.” The Town Park is listed in the “Walking Wild Lewisboro” booklet that is available for $5 at various Cross River and South Salem establishments. In the park, bear to the right and follow the dirt road up the hill above the Little League field. You should park in the upper parking lot. The trails go up the hill from the parking lot – the trailhead is easy to find. 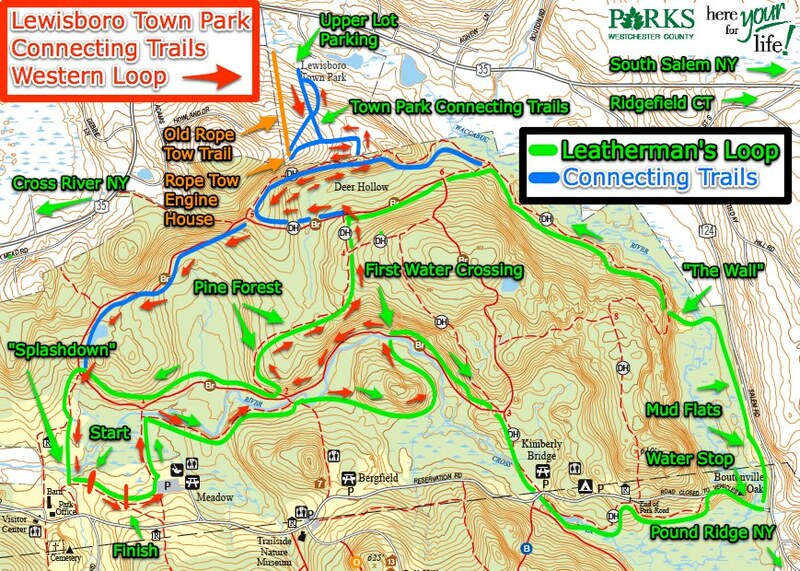 The town park trails and the Pound Ridge Reservation trails connecting to the Loop course are marked in blue near the top of the map to the left. The Loop course is marked in green and runs counterclockwise. Early on, the trail splits into two trails but then rejoins further up the hill as a single trail again. The two trails were originally two ski trails, served by a rope tow. The tow rope and engine hut are still there at the top of the lift area (marked on the map—click the map to see larger version). After joining back up together, the trail continues up the hill. Follow the trail as it turns left near the top of the hill. Take the first right turn on this trail. You will go under some power lines. This marks the boundary between the Lewisboro Town Park and the Pound Ridge Reservation. Once you follow the trail back into the woods (south) past the wires, you will see a Pound Ridge Reservation trailhead sign with information (and a sign in book). The total length in the Lewisboro Town Park is about 1/3 mile before you reach the Pound Ridge boundary. It is about a 250 ft vertical climb so it will get you warmed right up. When you enter the reservation, you are on the Deer Hollow loop. The trail goes east (left) and west (right). Turning left will take you to the quarry climb (sand hill) known as “The Wall” on the Loop map. This is about a mile or so down the trail. If you go right, you will head towards the intersection of Deer Hollow and the pine trees trail. Take the right turn (heading west) on the Deer Hollow trail after entering the Rez. At the next intersection, keep to the right. About a hundred or so feet further down the trail is another trail to the right. This trail heads out to Route 35 directly. Unless you are heading to Cameron’s Deli, stay on the main trail (the Brown Trail) and continue down the hill. The Brown trail continues down towards the “Splashdown” second stream crossing. There is another spur trail on the right about halfway to the stream crossing but stick to the main trail. The Brown trail comes to an intersection where you take the right turn (recap: skip first two rights, take third right). In about 1/10 mile or so after the intersection the trail opens up onto a meadow. In the summer and fall the meadow will have grown back a lot and you have to head straight through the tall grass after the trail veers right to reach the splashdown entry point. You can keep to the trail here and stay dry since there is a bridge not too far if you stay on the trail. But where’s the fun in that? After the splashdown water crossing, head up the meadow towards the start line then the finish line at the fallen Meadow Oak tree. At the meadow parking lot, make a left following the trail into the woods again. Just before the bridge (we’re not taking the easy way, remember?) make a right and parallel the river. When you pass the next bridge on the left, you head onto an unblazed single-track trail. The trail is pretty obvious although the park management does not clear much deadfall so this section is challenging. Conditions can vary greatly by season. Head around the hill and you will find yourself at the first Loop stream crossing (your second crossing for the run). Cross the stream and instead of following the Loop Course right, take a left and follow the river back west. When you approach the next bridge on your left, take a right turn up the hill into the Pine Forest. You are back on the Loop course again. Follow this for about 1/2 mile. Head straight on the trail past a right turn. This trail ends in a “T” intersection with the Brown/Deer Hollow trail. Take a left onto the combined Brown/Deer Hollow trail. Follow it to the next intersection where you take a right back up the hill towards the Lewisboro Town Park intersection and your car.